Canterbury Daily Photo: Church Interior Series: Marble in Chilham. Church Interior Series: Marble in Chilham. 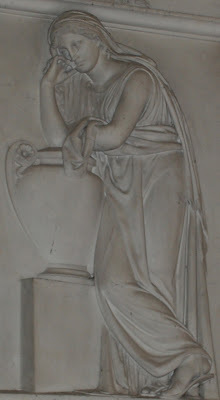 I found this wonderful marble work in Chilham church... don't you just love it? I agree with you that it is nice. Is it marble? Or is it that modern material that looks like marble but is actually cast in molds. That is a lovely piece. And your new spring pictures are wonderful, too! She's quite a lady. The marble really glows and lights up her face. A Set of Great Photographs Rose. Hope you are good. Rose, I think this carved statue belongs to Lady Margaret Kemp's monument with its four virtues by Nicholas Stone. Lady Margaret was wife of Sir Dudley Digges. A great picture, Rose. It reminds me of the Stuart's Monument in Vatican by Antonio Canova.